Clogged drains are impossible to live with because employees can no longer do their usual tasks. 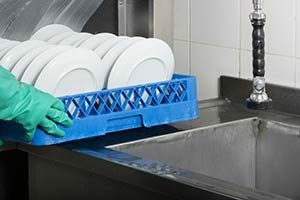 Clogged drains in commercial kitchens hold up food preparation and lead to unwelcome smells and overflowing sinks while clogged bathroom drains lead to obviously unwelcome problems. Thankfully, with commercial snake drain cleaning, businesses of all types and sizes can experience drains that are clean and that flow quickly. What Is a Commercial Drain Cleaner Snake? While drain cleaning snakes are often used in residential properties, the ones that are used in commercial areas are different because of the difference in pipe characteristics. A commercial drain cleaner snake is a long metal or plastic rod that is placed in the opening of the drain. This tool is threaded through the pipe, usually with the help of a hand crank, to break up clogs. LOOKING FOR AN ESTIMATE ON YOUR PLUMBING PROJECT? In addition, commercial bathrooms often suffer from clogs and slow-running drains. We provide help for the following types of commercial bathroom drains. Commercial drain snakes have stood up to the test of time and have proven themselves to be indispensable to commercial plumbing. This is more powerful than simple drain plunging is yet gentler than hydro jetting is. Therefore, snake cleaning is a good solution for very old pipes that may be thin or rusty. Of course, the biggest benefit to using a drain snake is that it provides fast relief for clogged drains. Business owners will be able to use their sinks and other plumbing once again and will not have to worry about overflows or flooding. Business that are wondering how to unclog a drain pipe can turn to All County Plumbing LLC for premier service on all types of drains. Getting clogs addressed quickly with commercial snake drain cleaning can ensure workplace efficiency and repeat customers. Plus, fast service helps businesses avoid extra costs from flooded workplaces, burst pipes and more. We’d love to email you a coupon for $100 OFF New Water Heater Installation! Leave your information below.